I’m reading Aimee Nicole Walker’s A Dye Hard Holiday. I absolutely ADORE the Curl Up and Dye Mysteries! I’m also reading Lucy Lennox’s A Very Marian Christmas, book 7 in another fave series of mine, the Made Marian series. What part of writing a book comes the hardest for you? The first 20% of the book is always the hardest for me because that’s where I know if everything I plotted out is going to work. It’s also what takes the most patience, because I want to jump right into the romance, but I know I need to write that buildup first. We need the development, the building of the foundation before we can get into the relationship. Um, probably about 15 to 20? All in various stages of completion. Only a handful of those I intend to get published. I tend to plot and work to an outline, though often things deviate from the outline. Sometimes it’s a very rough outline, and there are rare occasions when I just write and see where the characters take me. How do you keep characters consistent through a story? Do you write out extensive character bibles? If it’s a big series like the THIRDS, I keep notes and spreadsheets on character traits I’m likely to need to refer back to. I have someone who’s working on a huge story bible for me for the THIRDS that will include more than I’ve ever had the time to put together. For character consistency in behavior, I work out what a character is like before I start writing, and as I write they continue to grow and develop so it’s important to pay attention and make sure as the story continues that you’re staying true to your character. For your chance to win a backlist ebook from Charlie answer this question...what are you reading at the moment? 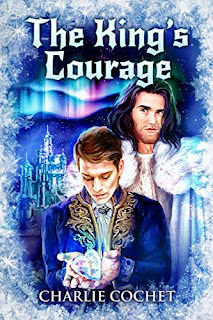 The King's Courage (North Pole City Tales #6) - OUT NOW! If you’d like to connect with Charlie, just drop her an email at charlie(at)charliecochet(dot)com, or find her on: Facebook, Twitter, Goodreads, Pinterest, Tumblr, Instagram, and Google Plus. I am going to start The King's Courage tonight. Just downloaded it this morning. Love this series! I just reread Mending Noel last night. I'm rereading the series to get in the mood for Christmas, since 2017 has been a bad year for sane Americans. I'm reading From Out in the Cold by LA Witt. I'm just about to read King's Courage. I'm on a Christmas book binge. Detective Fox and the Christmas Caper by Isobel Starling... It is fun!